If it's spring in Evanston, expect success from Wildcat athletics. The Wildcat spring sports teams continue to shine. Lacrosse claimed a third straight national championship, softball advanced to the semifinals of the Women's College World Series, and women's tennis claimed its ninth straight Big Ten Conference championship while advancing to the final 16 at the NCAA Championships. After winning two straight national women's lacrosse championships, head coach Kelly Amonte Hiller knew her team needed to step up its game to capture a third title. During every practice and every huddle throughout the season, she implored someone -- anyone -- to step up and take over. In the national championship game, Hilary Bowen did just that. "Our team is so dynamic that it can be any player on any day who steps up," said the now-junior attacker. "In the championship game, I just happened to find opportunities to take it to the goal." To be exact, Bowen found the goal five times, plus she assisted two goals, leading Northwestern to a 15-13 win over the University of Virginia at the University of Pennsylvania's Franklin Field in Philadelphia. Her seven-point MVP performance made Northwestern one of only two teams ever to win three straight NCAA women's lacrosse titles. Bowen couldn't do it alone, though. With Virginia trailing by only one goal late in the game, it was time for one of her fellow classmates to step up on the defensive end. Goalie Morgan Lathrop, who two days earlier held the host Quakers scoreless for an NCAA semifinal record 43 minutes, made a crucial save with 3:29 left in the championship against Virginia to keep Northwestern up by one. Then-freshman Katrina Dowd's third goal then clinched the Wildcats' victory. It was the 21st consecutive victory on the season for the 'Cats, with their only loss coming on the road against the University of North Carolina in the season opener. Northwestern scored only eight goals in that double-overtime defeat. From that point forward everything changed. Northwestern averaged an NCAA record 16.4 goals per game, while allowing just over six per game. They were the only team in the country with three 60-goal scorers, and two other Wildcats had 50. Leading the way was senior Kristen Kjellman (C07), who set a slew of Northwestern records and even holds the NCAA record for draw controls -- similar to a jump ball in basketball. "In the championship game, she only had one goal," Amonte Hiller said. "But we never would have won that game if it wasn't for her ability to take those key draw controls." Kjellman's all-around performance earned her a second Tewaaraton Trophy, honoring the nation's best women's lacrosse player. The school's first four-time All-American, Kjellman also won the Honda Award, which honors the most outstanding female collegiate athlete in each of the 12 NCAA-sanctioned sports, for the third consecutive year. In June, President George W. Bush honored the team for its three-peat. After announcing the Wildcats, he got a laugh by reminding the crowd of the first time the team appeared at the White House -- in flip-flops. "I might as well go on the record. ... I was disappointed in the footwear," President Bush said of this year's more modest shoe selection. "It's just too conventional, especially on a hot day." Having been a part of seven national championships in a row at Maryland, Amonte Hiller stopped short of calling this team's three-peat a dynasty. "But in terms of where we come from and how long ago we started, it's definitely impressive," said Amonte Hiller, who has a 13-1 record in NCAA Championship play. "To be a dynasty, I think we need to keep dominating while we have a bull's-eye on our backs," Bowen said. 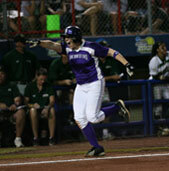 Northwestern outfielder Katie Logan (C07) bleeds purple. It's Wildcat shortstop Tammy Williams' favorite color. And first baseman Garland Cooper (C07) even dreams in purple. When ESPN recorded video introductions for every player before the Women's College World Series, Northwestern's message was clear. In an effort to stick out from the crowd, each Wildcat softball player made a reference to the team's color. "Last year, people said we had a great run," Northwestern head coach Kate Drohan said. "Making it back to the World Series sent a strong message. Now they're saying that we're a great program." After finishing second last season -- and facing one of the nation's toughest schedules this year -- Northwestern earned a program-record No. 2 seed in the NCAA Tournament. They won five straight postseason games to return to the World Series. "By competing against All-Americans and Top 10 teams early in the season, we've already played the best, so intimidation doesn't become a factor," Drohan said. In Oklahoma City, ace Eileen Canney (SESP07) pitched a pair of gems, shutting out Arizona State University and, in an elimination game, Baylor University. Those victories tied Canney with Lisa Ishikawa (McC88) atop Northwestern's single-season (33) and career wins list (97). But Northwestern was unable to return to the championship series, instead finishing third for the second time in the school's history. "I was much more emotional than I thought I'd be," Drohan admitted. "It was very difficult in one moment to deal with the feelings of our season ending and the realization that the seniors would be leaving the program." Each of those seniors graduated with a number of distinctions. Center fielder Logan made the Big Ten Conference's first team for a second straight year. Canney became the third player to win multiple Big Ten Pitcher of the Year awards. And right fielder Jessica Miller (WCAS07) will go down in history for hitting the longest home run in the history of Sharon J. Drysdale Field -- it traveled an estimated 290 feet and bounced off the roof of Welsh-Ryan Arena. The biggest honor went to Cooper, the only three-time conference player of the year. The slugger entered her senior campaign having never hit more than 11 home runs in a season. She harnessed her power and finished the year with 23 round-trippers and 55 in her career, both Big Ten records. "There were a few tweaks here and there, but the real difference was my mentality and strength," Cooper said. "I gained a lot of confidence in my swing and was able to get some of those doubles I hit last year over the fence." Cooper and Canney -- who called themselves a package deal when they came to Northwestern -- will bring their talents to the professional level with the New England Riptide, who play in Lowell, Mass. Canney was drafted second and Cooper fourth by former Northwestern coach -- and current Riptide manager -- Sharon Drysdale. As for Northwestern's current head coach, Drohan is starting to see the team she envisioned when she took over. Headlined by two former Big Ten Freshman of the Year -- junior Tammy Williams and sophomore Nicole Pauly -- next year's lineup could feature players exclusively from the Midwest, mostly from Illinois. "When we took over, we really wanted to invest in this state," Drohan said. "People in Illinois are pretty serious about softball, and we're excited about them choosing to play for Northwestern." As third baseman Darcy Sengewald exclaimed at the end of Northwestern's introductions, "It's time to start wearing purple!" Finally, Northwestern women's tennis won its ninth-consecutive Big Ten Conference championship and made its seventh NCAA Championships appearance in Claire Pollard's nine seasons as head coach.